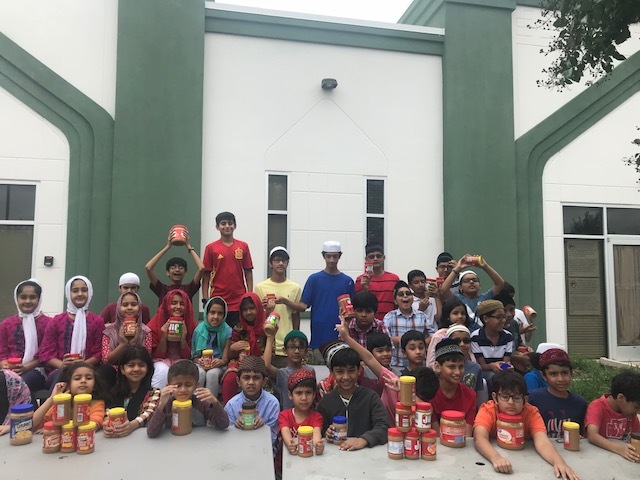 First of all Jazakallah to all the kids and parents for making the peanut butter drive successful. See attached picture. Also, wanted to share a few administrative announcements. 1. In the past we have been very good with check-in times but over time it feels like we are getting a little lax. Today we had more than 10 kids checking in after 11:00 pm. Please make sure you kids are at the masjid at 10:45, it can take up 10 mins to check-in so please plan accordingly. 2. To discourage physical contact and subsequent fights and wrestling matches, we are instituting a strict “no physical contact policy” during Tahir Academy hours. We recognize that kids need to burn their energy and we are working on getting the playground for them, but meanwhile we need your cooperation. Please take a few minutes to talk to your kids and help them understand the significance of respecting and behaving in the mosque. We may contact the parents if the any child is repeatedly found in violation of this policy. 3. All kids (except for Level 1) should have their HW folders and workbooks with them. If you kids does not, please contact me or Asim Ahmed and we should be able to get them to you. As I mentioned in the back to school night, kids will be responsible to keep their workbooks and HW folders with them throughout Tahir Academy. Teachers will collect HWs during classes and you need to make sure your kid has the HW folder and workbook before they check out. 4. Lastly, if you have the white binder from last year, please bring it to the next Tahir Academy, those will be converted into the HW folders for this year.